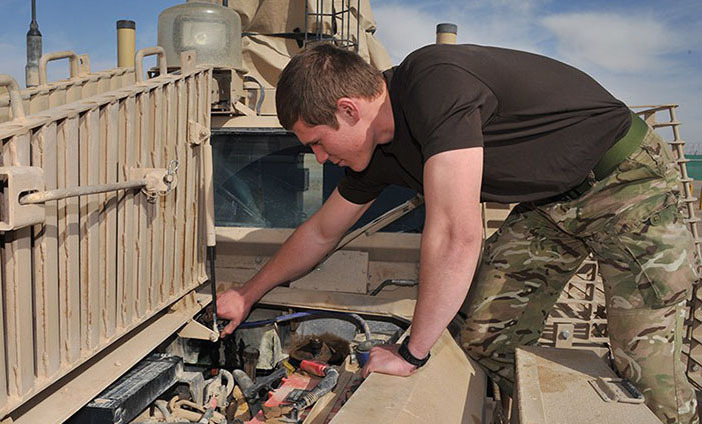 There are a wide range of vehicles in the Army from Tanks and Quad Bikes to HGVs and Land Rovers. Keeping them in good working order is a big job. That’s why we need Vehicle Mechanics. In this role, you get to work on different vehicles every day. Wherever you are in the world, you will keep our vehicles on the road, even in extreme conditions. It’s great experience and we’ll give you first-class training. You’ll gain driving licences and NVQ level 2 and 3 in Engineering. You can then build an exciting future inside or outside the Army. Then you go to the Defence School of Electronic and Mechanical Engineering at MoD Lyneham, Wiltshire. Here, you learn to be a mechanic. Over the next 46 weeks, you are taught how to fix vehicles and carry out maintenance, repairs, and inspections. Tanks,trucks, quads – you’ll work with all kinds of vehicles. You will also get the driving your car and HGV driving licences. First, you have basic training and learn to be a soldier. Then you go to the Defence School of Electronic and Mechanical Engineering at MoD Lyneham, Wiltshire. Here, you learn to be a mechanic. Over the next 46 weeks, you are taught how to fix vehicles and carry out maintenance, repairs, and inspections. Tanks, vans, motorcycles – you’ll work with all kinds of vehicles. You will also get the driving licences you need: category B and C+E.